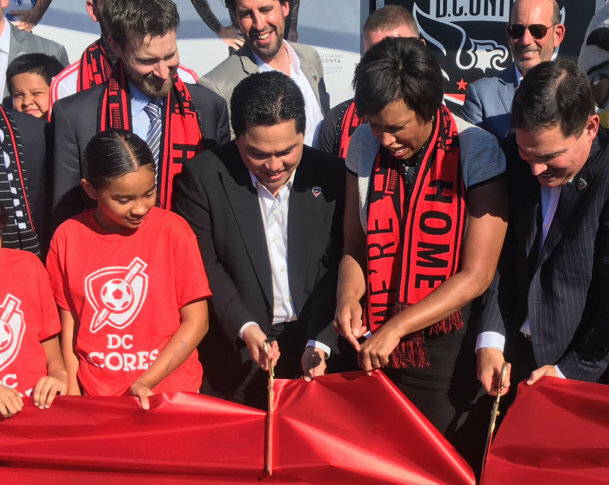 It was all smiles at Audi Field Monday as a project two decades in the works came to fruition. WASHINGTON — D.C. Councilmember Jack Evans has, of his own admission, been around for more pomp and circumstance than any of the many dignitaries whisked in to ceremonially open Audi Field in Southwest D.C. Monday afternoon. So his particular, over-the-top optimism seemed fitting for the congratulatory ribbon-cutting ceremony. Evans joked about sitting down with George Washington and Pierre L’Enfant to work on stadium plans, referencing just how long this project took to come to fruition. He called newest addition Wayne Rooney “the best player in soccer,” and claimed the District would double the 500,000 people that the Washington Capitals’ championship parade drew when the team brings the “World Cup of soccer” back to D.C., whatever that means. “You know, politicians love this. Next to groundbreakings, what do we love the best? Ribbon cuttings! So here we are to cut the ribbon on the best soccer stadium in America,” he said. On this day, nobody was in the mood to challenge the over-exuberance. It was a day when everyone who spoke — eight dignitaries in all, not counting the poet or the MC — spent most of their time thanking and drumming up applause for everyone else on stage. For his part, Rooney credited the new stadium as a major reason he ended up in Washington. Audi Field is the 19th stadium in MLS, but will only remain the league’s newest until Allianz Field in Minnesota comes online next year. After that, five more are planned. But MLS Commissioner Don Garber, who knows the D.C. market well, said this one stood out. “This was the one stadium that we knew we needed and that we were waiting for, for so long,” he said. For United CEO and managing partner Jason Levien, it was the fulfillment of the promise he made when he invested in the club. “I just want to take this in for a second,” he said, looking around. And while much of the stadium is still an active construction site, a work very much in progress, there will be soccer in Southwest D.C. this Saturday.